The Licensed Software was created in cooperation with Smart PC Solutions, Inc. and Avanquest. Before you use the Licensed Software, please read this EULA as carefully as you would read any other legal document. This End User License Agreement (EULA) is a contract between you (“you,” “your” or “Licensee”) and Avanquest Software SAS (“Avanquest”), which provides the terms and conditions under which the Licensed Software named above is licensed – not sold – to you. The Licensed Software includes computer software and may include associated media, printed materials, “online” or electronic documentation, and Internet-based services. If you are a residing in, located in, or citizen of the United-States when purchasing the Licensed Software, please be aware that this EULA provides for Class Action Waiver (as set forth below, the “Class Action Waiver” provision) and for your Disputes (as defined below) with Avanquest to be referred to binding Arbitration (as set forth below, in the “Dispute Resolution” provision), which may affect your rights under this EULA. You may opt out of the binding individual arbitration and class action waiver as provided below. The Licensed Software may require activation as explained during installation and in the Documentation. Such activation may require that you submit a serial number and register an account with us. (Note that if you are installing a trial version of the Licensed Software, you may not need a serial number to activate it, but we may limit the length of time for which you may use the Licensed Software and/or the scope of the Licensed Software Functionality.) If activation is required and not completed within the finite period of time set forth in the Documentation and/or explained during installation, then the Licensed Software will cease to function until activation has been completed, at which time functionality will be restored. 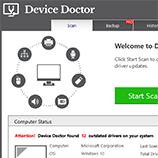 If Licensee has any problem with the activation process, Licensee should contact Device Doctor at support@devicedoctor.com. (8) Licensee may not use the Licensed Software in any manner not authorized by this EULA. SOFTWARE UPDATES.